It's time for a new guest! This week Scott from the Frankly, My Dear podcast joins us to discuss Denzel Washington. After we get to know Scott a bit better, we talk about new movies we watched with Shut Up, Little Man, The Muppets and Mirror Mirror. But since Denzel has a such a lengthy career and there were three of us, we decided to skip a random segment and get down to business. 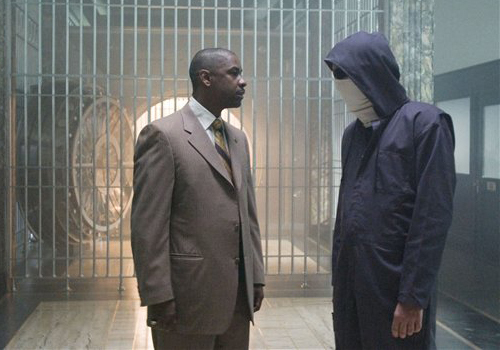 I decided to rewatch a lot of Denzel's movies for this episode, because most of his offering from the past 10 years I had only bothered with once, including Inside Man. I liked it after seeing it in the theater, but I was on a Clive Owen kick at the time and all but forgotten about Denzel in it. I'm glad I revisited it, because this is certainly one of his better performances in the last decade. As a hostage negotiator at a bank heist, Denzel brings a lot of surprising one-liner humor and wit to his role. Though Clive Owen's motivation for the heist is the main focus, the movie wouldn't have been nearly as good had Denzel played the lead cop as a complete straight man. There are still elements of the overall plot that are lost on me, but Denzel brings something extra that elevates it beyond a heist movie with a twist. I'm glad I gave it a second viewing to rediscover that. I was shocked at the simplicity of this movie's concept - a stupid railroad worker jumps off a slow moving train to hit a switch and then can't get back on the train. The rest of the movie is about stopping an unstoppable train. This movie pretty much only has originality and good acting going for it, but it's really refreshing that it actually has all it needs. Watching Denzel and Chris Pine eventually come to the rescue was exciting and nail-biting. Rosario Dawson is in charge of the signaling and does a good job making sure this movie doesn't go over the top with the craziness. She's pretty sure they can fix the problem before it gets out of control, which of course it does. But at a good pace. This movie doesn't have any right to be any good, but it's great. And for a Tony Scott film, it's remarkably short, under 100 minutes! Hi Jess and Rachel! Nice job on the latest show. It was cool to hear Scott as a guest; I'm also a big fan of the Frankly My Dear podcast. There were some instances where I disagreed with the thoughts this week. I'm a big fan of Spike Lee, so that might play a role. On Malcolm X, my take is that Lee cast Denzel because they'd worked together so well on Mo' Better Blues and he could handle the difficulties of this role. I don't think it had anything to do with him being the standard choice for black actors at the time. I'm a big fan of this movie and feel that Lee did an amazing job when you consider all the pressure on him to present the life of such a beloved and controversial figure. I also think that Ray Allen wasn't bad in He Got Game. I'll admit that he's not on Denzel's level, and the uncertainty of his character makes him seem a bit shaky at times. However, he's much better than your typical athlete on screen. I don't consider it one of Lee's best films, but it's a solid movie. I think Inside Man was the only Spike Lee film I thoroughly enjoyed, and even the motives of some of the characters are still lost on me. As for Malcolm X, as good as Denzel was, I think it may have been more beneficial for Lee to cast a relative uknown, though funding would probably have been harder to obtain. I guess I'm still alone on Ray Allen's acting in He Got Game. It wasn't unbearable, and I felt he was mostly adequate, but there were too many instances where I could tell he was trying too hard or not enough. Rachel, you make a good point about the funding. From what I've read, it was really hard for Lee to even get enough money to complete the movie. He had to lean on a lot of people like Bill Cosby and others to get the extra money. Without Denzel, I'm thinking he would have had to cut down the scale considerably. It's worth asking if that would help the movie, though. I disagree, but I can see that it might be a valid point. I also really liked Ali, and that stuck with about 10 years of his life. I'm glad Lee took the time he did with Malcolm X, because with such a controversial figure, we needed to see his early life, at least in part, to know where he was coming from in his beliefs. As for Ali, I'll be seeing that this week for the first time! Thanks, Dan! I'm a big fan of you too! And thanks Rachel/Jess for having me on the show! So glad you joined us with a great career to discuss!